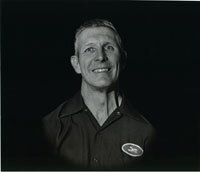 Tommy Thompson was a fixture of the University of Wyoming campus for 33 years, retiring in 1993. The "Friends of Tommy" committee is working to preserve his memory with a sculpture in one of the flower gardens he cultivated for decades. Friends of longtime University of Wyoming employee Tommy Thompson are working to preserve his memory with a sculpture in one of the flower gardens he cultivated for decades. The "Friends of Tommy" committee formed after Thompson's death in 2010 at the age of 74. The group, which aims to place a life-sized sculpture of him in the flower gardens south of Merica Hall, is seeking private donations for the project in conjunction with the University of Wyoming Foundation. 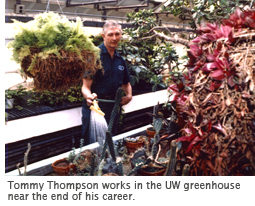 Thompson worked at UW for 33 years. Overcoming a significant physical impairment from birth, he earned a bachelor's degree from UW in range management in 1958 and started working in the UW greenhouses in 1960. He rose to greenhouse supervisor and floriculturist by his retirement in 1993. "What made Tommy such an institution at UW was that everyone knew him - 33 years of students, faculty, staff, campus visitors and most of the Laramie community at large," says Pennie Espeland, one of the Friends of Tommy organizers. "Not everyone knew him by name, but his presence on campus was unmistakable. Often on his hands and knees with difficulty, he was seen alongside his summer helpers planting those thousands of young flowers and, later, alongside them watering and weeding. Who could not fail to see this man, who obviously had significant physical limitations, giving his all to beautifying the campus he loved so much?" Wyoming artist Bob Seabeck has created the artist renderings for the sculpture, and the group has contracted with Laramie sculptor Vince Valdez to create the three-dimensional design and cast the bronze. UW will provide the base for the sculpture. The committee is working to raise $34,000 to cover the costs of the project, with a goal of placing the sculpture this fall. Those who'd like to contribute may do so by giving gifts online at www.uwyo.edu/giveonline or by contacting the UW Foundation at (888) 831-7795, (307) 766-6300, or by email at foundation@uwyo.edu.